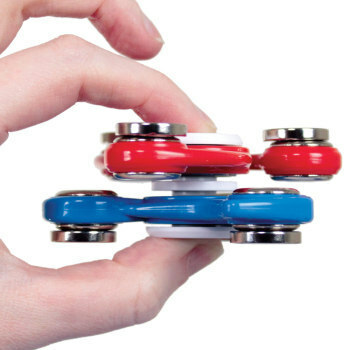 The PhiTOP, Gyroscopes & Tops: Educational Innovations, Inc.
We've fallen in love with the PhiTOP, and bet you will, too! This beautifully crafted top does for angular momentum what Newton's Cradle does for linear momentum. When spun, it starts out horizontal and then, surprisingly, stands upright. Wow! In the process, it illustrates the difference between equilibrium and stability. The rise of the "center of mass" is a fascinating physics problem. 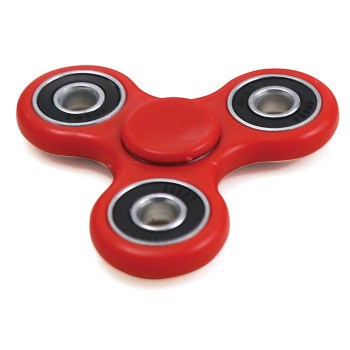 It will spin for minutes on end, producing a marvelous optical illusion as it slows down. Invented by astrophysicist Kenneth Brecher, the PhiTOP encourages exploration of force, mass, density, gravity, friction, and time. In short, the PhiTOP is an elegant scientific, mathematical, and aesthetically-pleasing object that makes a perfect gift, desktop display piece, or student stumper. See for yourself in our video! Egg is ~5 cm tall (2"). Bring a refrigerator magnet next to a PhiTOP that is made from a non-magnetic metal such as aluminum or brass while it is spinning and it will slow down and stop. This is a simple demonstration of the magnetic induction principle that underlies Nikola Tesla's famous 19th century Egg of Columbus demonstration that led directly to the acceptance of AC electricity over DC. 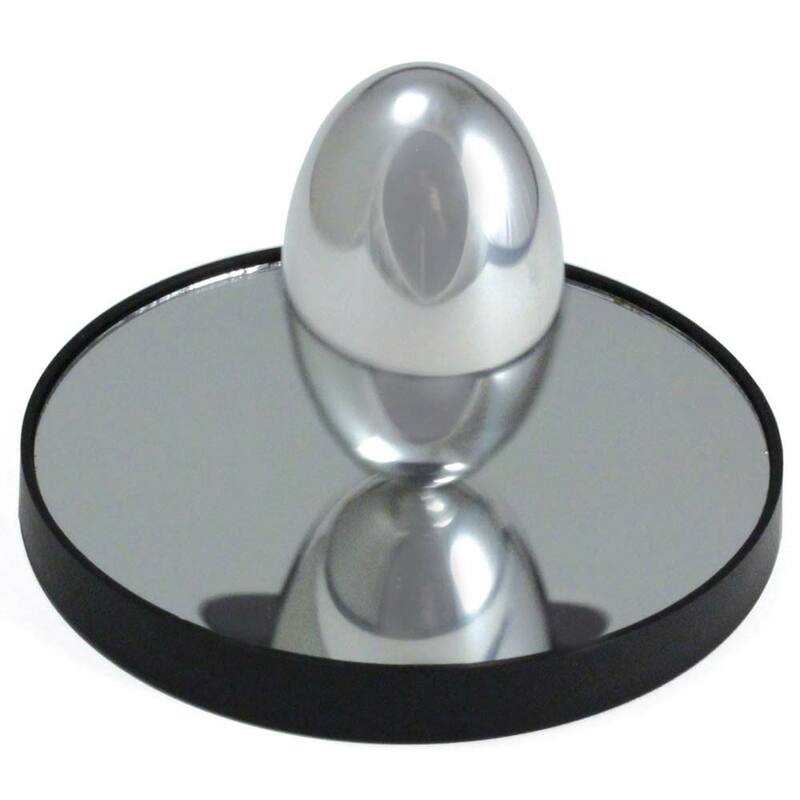 The original 19th century apparatus employed a rotating 3-phase magnetic field configuration with no moving parts to spin up a copper egg shaped object. Very smooth, high quality. Set it on top of a magnetic stirrer, and eddy currents will spin the egg just as an AC motor spins a squirrel cage rotor. Imperfections in how it is spun up and an little imperfections in the surface of the egg or the mirror cause the egg to not quite spin on center. Friction causes the egg to begin rolling. The combination of spinning and rolling is called "spolling" (look it up) and gyroscopic precession causes the energy of the spin to gradually transfer from the spin to the roll. The roll becomes the new axis of spin as the egg stands up on end. You can better see spolling while watching an Euler's Disk. This thing spins me out! I have a metal flip over top but wanted something bigger for larger audiences. Saw this on youtube but could not find it. Wallah! Here they are and at a reasonable price. I had to go back to youtube to see some different spinning techniques but found that using both thumbs works best for getting the top up to speed to spin without a wobble. Like it! Students can use the PhiTOP in an investigation to compare the effects of different strengths or different directions of pushes and pulls on the motion of an object. Students can use the PhiTOP in an investigation to describe and classify different kinds of materials by their observable properties. Students can use the PhiTOP to plan and conduct an investigation to provide evidence of the effects of balanced and unbalanced forces on the motion of an object. Students can use the PhiTOP in an investigation to gather evidence to construct an explanation relating the speed of an object to the energy of the object. Students can use the PhiTOP in an investigation to provide evidence that the change in an object's motion depends on the sum of the forces on the object and the mass of the object. Students can use the PhiTOP as a concrete introduction and demonstration on mass and motion. Students can construct and interpret graphical displays of data to describe the relationships of kinetic energy to the mass of an object and to the speed of an object. 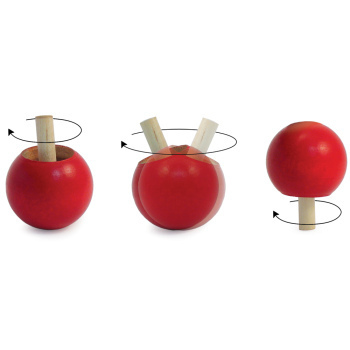 Students can use the PhiTOP to demonstrate how mass and momentum affect motion. This can be transferred into a mathematical representation to support the claim that the total momentum of a system of an object is conserved when there is no net force on the system. Students can use the PhiTOP as a physical model in conjunction with a computational model to calculate the change in the energy of one component in a system when there is a change in energy of the other components. The PhiTOP encourages exploration of force, mass, density, gravity, friction, and time. When spun, it starts out horizontal and then stands upright. In the process, it illustrates the difference between equilibrium and stability. Younger students can use the PhiTOP for a compare-and-contrast investigation using a variety of textured materials to spin the orb on.